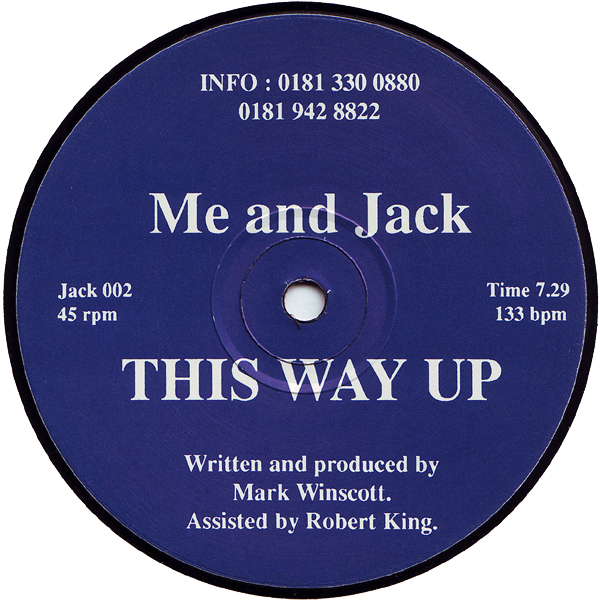 And This Is What You Get When You Least Expect It: Me and Jack - This Way Up / Satisfaction 12"
Me and Jack - This Way Up / Satisfaction 12"
This is the 1995 Me and Jack double-sided 12" release for the follow-up to the 1993 über progressive house monster "Viva House". 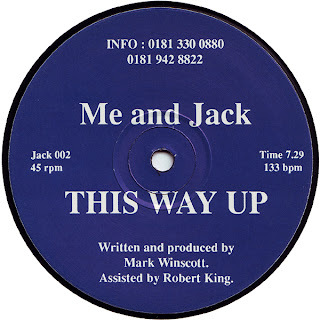 The A side cut is a 4/4 and breakbeat hybrid that utilized a thick bassline, squiggly synth work and fluttering arpeggios to construct a solid track that fit well with the predominant sound of the mid 90's progressive house scene. The B side song is a house-ier tune that uses a female vocal sample to give the track cohesion and some drive. A solid work to compliment the A side and make this vinyl worthy of flipping over again and again. Both sides of the 12" are here for your listening enjoyment. Oh how i love the Viva House release. I'm pretty sure i'll love this one too. btw: you don't have the Viva House release do you? I posted the original one sided 12" for Viva House on the older version of this blog. Man you rock, i mean you electronic! tysvm!! !